The first time we found the perfect leather jacket? Life-changing. The first time we found the perfect faux leather jacket? An absolute game-changer. Everyone strives for that effortless “cool-girl” look. And what’s the instant gateway to cool? The sleek, leather jacket. We’ve sought out the most timeless, yet trendiest faux leather jacket on the market. And, after a long, tireless journey, we’ve finally found it: the BlankNYC Faux Leather Moto Jacket. The faux leather moto jacket is a stape for the girl-on-the-go, who loves both edge and elegance. No wonder why it is a favorite of Kendall Jenner, Gigi Hadid and even Taylor Swift. And, we can’t blame them. It is the perfect option when looking to take a look from day to night, effortlessly. 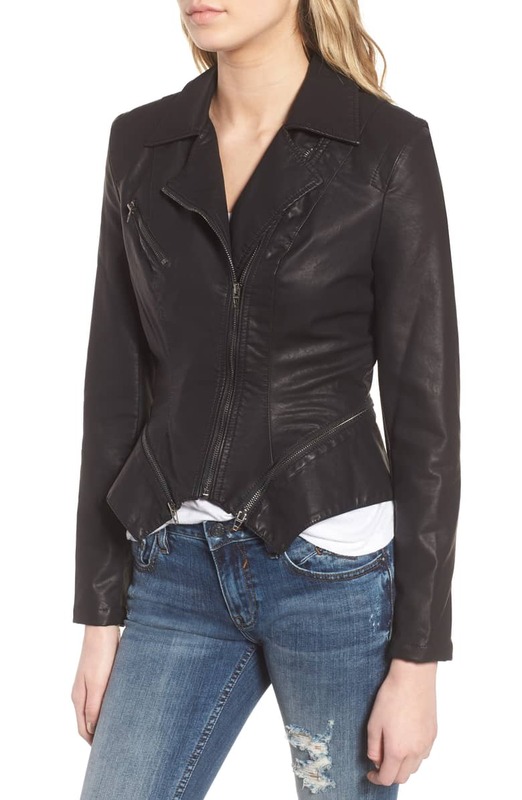 See It: Grab the BlankNYC Faux Leather Moto Jacket starting at $58 at Nordstrom! The BlankNYC Faux Leather Moto Jacket checks all the boxes when looking for the perfect transitional piece. And, we mean perfect. The tailored design, zippered hems, and notched collar make it both sophisticated and sensible. The faux leather moto jacket is an everyday must-have. For shoppers looking to upgrade their street style “cred,” mix the faux leather moto jacket into the day-to-day rotation. Perfect when paired with leggings, sports bra and sneakers, this moto jacket is a stylish staple when transitioning from the gym to lunch. Especially when shoppers are hoping to leave their oversized bags at home. The moto jacket has us covered. The chest zip pocket is perfect to keep anything from keys to phones safe throughout the day. Talk about the jacket that keeps on giving! The moto jacket is not only a gym essential but an everyday essential as well. Shoppers looking for a year-round staple, look no further. The moto jacket is the perfect transitional piece to take from season to season. For a more feminine option, shoppers can pair the moto jacket with a bright, printed dress and strappy sandals for the perfect summer night option. 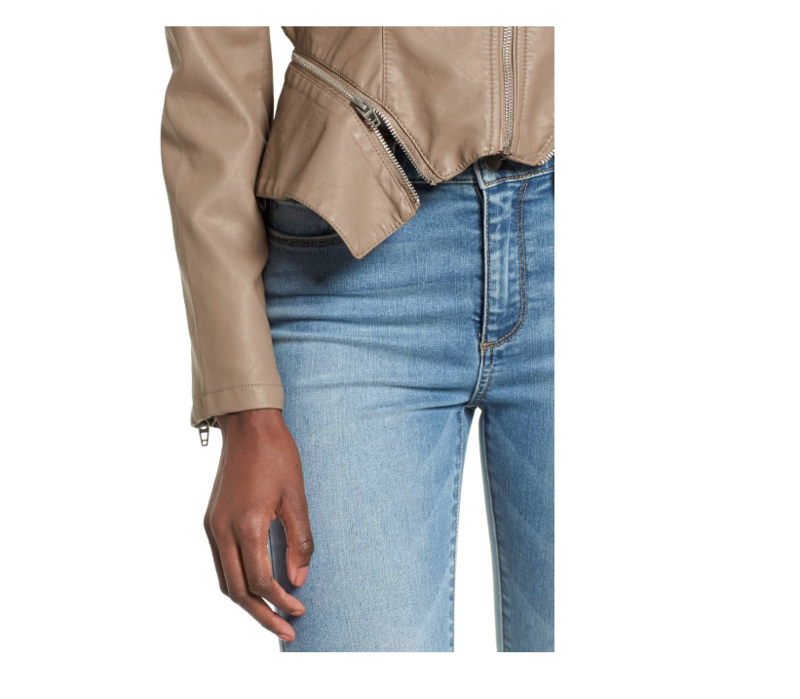 Let the moto jacket hang over shoulders for a more delicate feel! When colder winter comes, the moto jacket is perfect when paired with over-the-knee boots, jeans, and a chunky sweater. The options are endless! Even better? The colors. BlankNYC’s Faux Leather Moto Jacket is available in not one, but three colors: Black, Sand Stoner, and Grey Grisaille. The differences? For starters, Sand Stoner is ideal for someone looking for a more neutral approach to the traditional moto jacket. It’s the perfect beige shade and would be ideal for someone looking for a suitable staple that will transition nicely from season to season. The black option is chic and classic. It’s perfect for the girl looking for consistency in their everyday wardrobe, but looking for a less than basic approach! Lastly, there is the Grey Grisaille option. We’d like shoppers to be aware although it is called grey is more of a periwinkle grey. We love how bold yet soft this hue is! It will demand attention and for sure receive many compliments. All while being soft enough to blend in! Sure, we can go on and on about why this jacket is so magical. Instead, reviewers don’t just recommend — they insist trying out the most “perfect” jacket ever. Most shoppers said they couldn’t believe this jacket was made from vegan leather, insisting it looked and felt like authentic leather. Others raved about how the tailored fit was perfect, but recommended sizing up if looking to wear with sweaters. Some noted that this modern cut looked great with almost every outfit and was just feminine enough thanks to the tailoring. Almost all shoppers pointed out how they were on the quest for the perfect leather jacket and this one ended up being it. We fondly remember spending hours trying on countless items in hopes of finding “the one” leather jacket, jeans or whatever else. Sifting through endless racks, it always seemed hopeless. 9 out of 10 times, we’d leave discouraged or even worst with something we settled for. Can you even imagine? A time where we settled. Well, we did, and the buyer’s remorse still haunts us to this day. But we’ve made it our personal mission to save our shoppers from that very same buyer’s remorse. So when we read that almost every other shopper felt this jacket was “the one,” we felt like we hit the leather jacket jackpot. 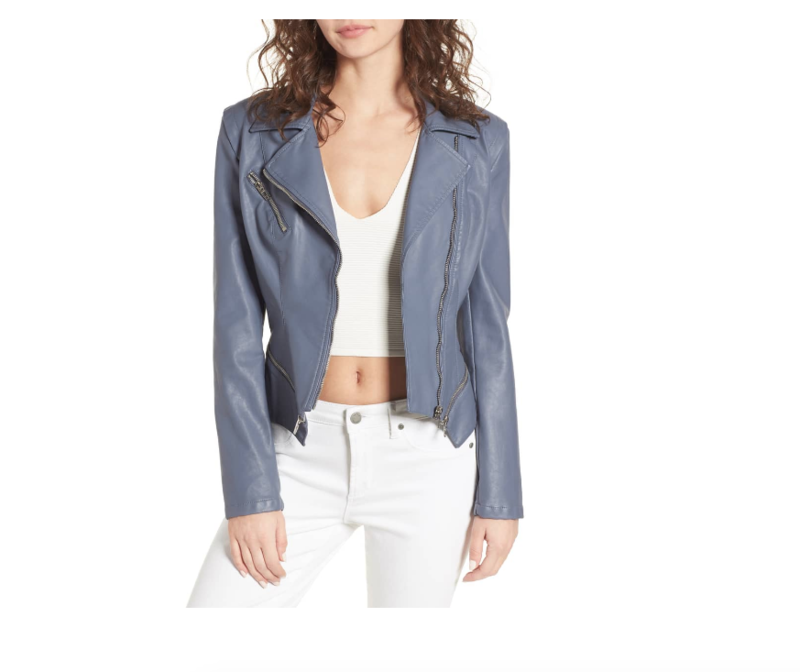 See It: Grab the BlankNYC Faux Leather Moto Jacket starting at $58 at Nordstrom! Not exactly your style? Check out other jackets available at Nordstrom!